China's Banxing-2 cubesat captured this view of the nation's Shenzhou-11 spacecraft (top) docked with the Tiangong-2 space lab in October 2016. 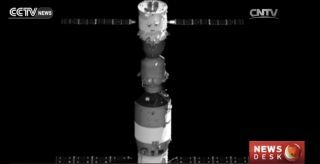 A tiny satellite has provided the first good look at China's orbiting Tiangong-2 space lab. Tiangong-2 launched on Sept. 15, and two astronauts aboard a spacecraft called Shenzhou-11 docked with the vehicle last week. On Sunday (Oct. 23), these two crewmembers, Jing Haipeng and Chen Dong, deployed a 104-lb. (47 kilograms) satellite from the orbiting complex. That fly-along "cubesat," known as Banxing-2, has now beamed home hundreds of up-close images of the two linked-up spacecraft, Chinese officials said. "From that distance, the image has a resolution of about 1 centimeter [0.4 inches]," Zhong Hongen, chief designer of the Space Application System, Manned Space Flight Project, said in an interview with China's CCTV News. "The image clearly shows the equipment and facilities outside the spacecraft-space lab complex," Zhong added. "The images it sent back show the camera has met its requirements and is working very well. When the microsatellite next orbits above the spacecraft and space lab, it will take photos again. Then, everyone will see images of the complex with the Earth in the background." Tiangong-2 is a test bed designed to prove out the rendezvous, docking and life-support technologies that China will need to build a permanently staffed space station, which the nation aims to do by the early 2020s. The space lab follows in the footsteps of Tiangong-1, which launched in September 2011 and docked with three Shenzhou craft (two of them crewed) from November 2011 through June 2013. Jing and Chen are scheduled to stay aboard Tiangong-2 for 30 days, and spend a total of 33 days in space, on the current mission. This will set the Chinese record for the longest crewed spaceflight mission. The previous mark of 14 days was set by the crew of Shenzhou-10, which visited Tiangong-1 in June 2013.